value and quality at competitive pricing. The Eyeglass Gallery Optical Shops offer a wide selection of frames at both locations in Elkhorn and Burlington, WI. Designed first and foremost with our patients in mind, our goal is to provide unmatched service, quality products at affordable and competitive prices, wide frame selection, and precision craftsmanship with our in-house lab. 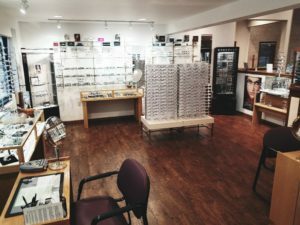 Our goal is service that starts with a quality product, craftsmanship in fabricating and fitting the glasses, and continues with free adjustments for the life of the glasses. Our pricing is competitive with any chain or mall store plus our products offer tremendous value over a wide range of styles to accommodate everyone’s budget. Children’s frames, lenses for your present frames, tints, safety glasses, specialty products – whatever your optical needs, we look forward to serving you, our patients. Of course, outside prescriptions are welcomed as well!